Painful shoulder swelling is not an uncommon presenting symptom and can be secondary to a variety of underlying causes, ranging from inflammatory to neoplastic. 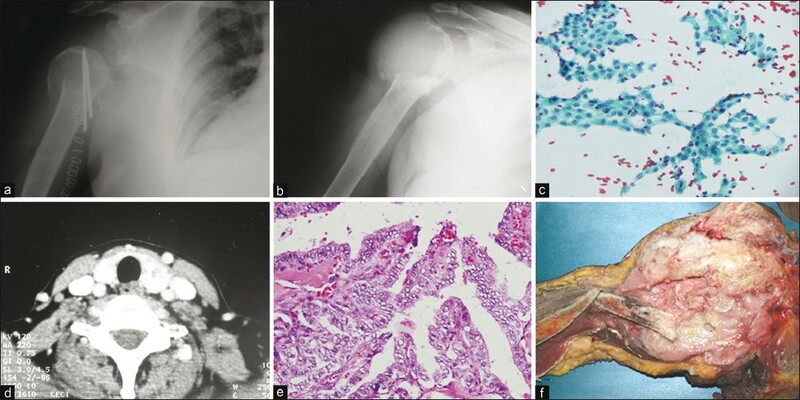 We report a rare case of rapidly enlarging painful shoulder mass caused by anaplastic transformation of papillary thyroid carcinoma beginning as a solitary osteolytic lesion in the humerus. Anaplastic transformation occurred 8 years after the primary diagnosis and mimicked soft tissue sarcoma clinically. Although anaplastic transformation of papillary thyroid carcinoma at distant extrathyroid sites is described in the literature, it has not been reported at the shoulder and from India before. A 52-year-old woman presented with fracture of the upper end of the left humerus and dislocation of the shoulder joint after a trivial trauma in Feb 1998 for which nailing was performed [Figure 1]a. After 3 months, the nail was removed as she complained of pain and discomfort. Despite physiotherapy, her pain continued and became intolerable. Repeat X-ray in Dec 2000 showed an expansile lytic lesion in the left humerus [Figure 1]b. Fine needle aspiration cytology performed from the lesion showed features suggestive of metastatic carcinoma thyroid [Figure 1]c. Contrast-enhanced computerized tomography (CECT) of the neck performed subsequently [Figure 1]d showed enlargement of both lobes of the thyroid. Her total thyroidectomy was performed, which revealed features of well-differentiated papillary carcinoma thyroid [Figure 1]e. No component of poorly differentiated carcinoma or spindle cell morphology was seen throughout the tumor. Post-operatively, she was administered radioactive iodine for ablation seven times over a period of 8 years. She remained asymptomatic during this period. However, for the last 1 year, she has been complaining of painful shoulder swelling that was increasing in size. The swelling did not respond to palliative radiotherapy and it increased to a size of 20 cm × 15 cm within 6 months. Incisional biopsy showed a spindle cell sarcoma that was immunonegative for pan cytokeratin, epithelial membrane antigen (EMA), smooth muscle actin (SMA), S-100 protein, CD 34, desmin, myogenin and bcl- 2. Disarticulation of the left shoulder joint was performed. Gross examination of the disarticulation specimen of the left shoulder showed a grayish-white tumor in the soft tissue destroying the head and upper part of the humerus and measuring 19 cm × 16 cm × 15 cm [Figure 1]f. A pathological fracture was identified at the junction of the upper and middle third of the humerus. The cut surface of the tumor revealed areas of hemorrhage and necrosis. The tumor tissue was routinely processed and a panel of immunohistochemical stains was performed to characterize the lesion using antibodies directed against pan cytokeratin, vimentin, thyroid transcription factor-1, SMA, desmin, myogenin, EMA, S-100 protein and bcl2. Multiple sections examined from the lesion showed spindle cell tumor with moderate to marked nuclear pleomorphism [Figure 2]a and b and mitotic count of 6-7/10 hpf. On extensive sampling, epithelial-looking areas were also seen [Figure 2]c. Papillary or follicular differentiation was not identified even after extensive sampling. Tumor cells showed immunopositivity for CK in the epithelial areas and TTF-1 expression in the sarcomatous areas [Figure 3]a and b. Based on morphological and immunohistochemical findings, the diagnosis of metastatic anaplastic thyroid carcinoma (spindle cell variant) was made. She developed hemiplegia secondary to central nervous system (CNS) metastasis after 8 weeks of surgery and died of respiratory insufficiency within 2 months. Autopsy could not be performed as consent for the same was not given by the relatives of the deceased. Papillary carcinoma is the most common thyroid malignancy and accounts for 80% of all thyroid carcinomas. Most of the tumors manifest in adults of 20-50 years, with a female predominance. Because of paucity of patients with bone metastasis, very few studies have investigated the prognostic factors of bone metastasis from well-differentiated thyroid cancer. ,, Although variable parameters like presence of metastasis at the time of presentation and tumor type has been reported to influence survival, no single predictive factor has been identified till date that accurately predicts anaplastic transformation in bone metastasis of well-differentiated thyroid carcinoma. Anaplastic carcinoma thyroid is known to arise or occur simultaneously with a well-differentiated thyroid cancer. However, anaplastic transformation of papillary thyroid carcinoma at distant extrathyroid sites is rare, although well documented in the English language literature. ,,,, Sotome et al. described a case where anaplastic transformation occurred in ectopic thyroid tissue. Subsequently, this transformation has been reported at different sites including lungs, retroperitoneum, liver and breast ,,,, [Table 1]. The age range in these cases varied from 58 years to 83 years, with a female preponderance. Duration between diagnosis of primary thyroid carcinoma and anaplastic transformation varied from 5 years to 20 years. Anaplastic carcinoma on histopathology showed different morphologies, including spindle cell, giant cell and undifferentiated carcinoma. In one of the cases, rhabdoid inclusions were observed. Recently, some of the studies have suggested the role of radioactive iodine in anaplastic transformation of papillary thyroid carcinoma. , Although history of post-operative radioactive iodine was seen in four of six cases, including the present case, whether it played the role in anaplastic transformation or not is not clear. Considering the site and clinical presentation in the present case, clinical diagnosis of soft tissue sarcoma was kept. However, histopathological findings and immunohistochemical profile revealed features of anaplastic carcinoma. Although described at various extrathyroid sites, anaplastic transformation of metastatic papillary thyroid carcinoma has not been reported at the shoulder before. Our patient was youngest and had the second shortest duration between primary diagnosis and anaplastic transformation among the cases of anaplastic transformation at extrathyroid sites. Initial presentation of papillary carcinoma thyroid as an osteolytic lesion in humerus was another rare feature. To conclude, although rare, the possibility of anaplastic carcinoma should be considered in the differential diagnosis of rapidly enlarging painful mass in the shoulder in a known case of papillary thyroid carcinoma. Clinicians, oncologists and pathologists should be aware of this entity to prevent misdiagnosis from sarcoma. The role of post-operative radioactive iodine as a safe modality needs to be further investigated. 1. Al-Qsous W, Miller ID. Anaplastic transformation in lung metastases of differentiated papillary thyroid carcinoma: An autopsy case report and review of the literature. Ann Diagn Pathol 2010;14:41-3. 2. Shaha AR, Shah JP, Loree TR. Differentiated thyroid cancer presenting initially with distant metastasis. Am J Surg1997;174:474-6. 3. Wu K, Hou SM, Huang TS, Yang RS. Thyroid carcinoma with bone metastasis: A prognostic factor study. Clin Med Oncol 2008;2:131-6. 4. Orita Y, Sugitani I, Matsuura M, Ushijima M, Tsukahara K, Fujimoto Y, et al. Prognostic factors and the therapeutic strategy for patients with bone metastasis from differentiated thyroid carcinoma. Surgery 2010;147:424-31. 5. Pittas A G, Adler M, Fazzari M, Tickoo S, RosaiJ, Larson SM, et al. Bone metastases from thyroid carcinoma: Clinical characteristics and prognostic variables in one hundred forty-six patients. Thyroid 2000;10:261-8. 6. Ganguly R, Mitra S, Datta AK. Synchronous occurrence of anaplastic, follicular and papillary carcinomas with follicular adenoma in thyroid gland. Indian J Pathol Microbiol 2010;53:337-9. 7. Sotome K, Onishi T, Hirano A, Nakamaru M, Furukawa A, Miyazaki H, et al. A rare case of anaplastic transformation within the metastatic site of the retroperitoneal region in a patient 17 years after total thyroidectomy for papillary carcinoma of the thyroid beginning with multiple bone metastases. Thyroid 2007;17:1309-11. 8. Takeshita Y, Takamura T, Minato H, Misu H, Ando H, Yamashita T, et al. Transformation of p53- positive papillary thyroid carcinoma to anaplastic carcinoma of the liver following postoperative radioactive iodine-131 therapy. Intern Med 2008;47:1709-12. 9. Angeles-Angeles A, Chable-Montero F, Martinez-Benitez B, Albores-Saavedra J. Unusual metastases of papillary thyroid carcinoma: Report of 2 cases. Ann Diagn Pathol 2009;13:189-96. 10. Togashi S, Oka K, Kanayama R, Koyamatsu S, Tobita T, Yatabe Y, et al. Thyroid anaplastic carcinoma transformed from papillary carcinoma in extrathyroid area. Auris Nasus Larynx 2004;31:287-92. 11. Shingu K, Kobayashi S, Yokoyama S, Maruyama M, Kusama R, Amano J. The likely transformation of papillary thyroid carcinoma into anaplastic carcinoma during postoperative radioactive iodine-131 therapy: Report of a case. Surg Today 2000;30:910-3.